More than 500 members of the Ren family pose for a photo at Shishe village in East China's Zhejiang Province. Ren family members spent two years locating 2,000 relatives. 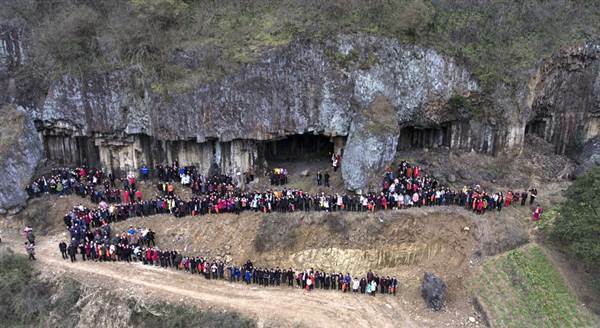 Shishe village, a small community in East China's Zhejiang Province, has become famous because of a supersized family photograph showing 500 members of the Ren family gathered together during the Spring Festival. Ranging in age from a few months to over 90, the family spans six generations. A total of 19 photographers and four drones were used to take more than 70 photos of the group. Ren Tuanjie, the Communist party chief of Shishe village, said that the 500 people in the photograph represent just a part of the Ren family and that the whole family totals more than 1,500. Most of the 500 family members came from all over the country to attend this Spring Festival family reunion. Some of them even traveled from Australia. Their purpose was not just participate in a supersize family photo, but also to celebrate completion of the Ren family tree. Their ancestor was born in the Southern Song Dynasty (1127-1279). He moved to Shishe village from Shaanxi Province in Northwestern China 765 years ago. On September 8, 2014, the Ren family decided to work out a complete family tree. "I want to record the history of the whole family and let descendants all over the world know about their roots," said Ren Tuanjie. In order to complete the genealogical task, he and other members spent nearly two-and-a-half years to collect information all over the country. They used telephone, letter, and even social media tools to contact family members. Ren Tuanjie said they even got help from local police stations if they ran into difficulties in tracing missing kin. "No matter how far apart we are, we will return to our roots if necessary, that's why so many members of the Ren family come back for the reunion and the family photo," said Ren Qiaozheng, "The family tree can reveal our roots and that makes us feel this is our home." Although the old family members know each other very well, the young family members don't have that same sense of familiarity. These mostly live in big cities, speaking standard Mandarin, and playing with their computers and IPad all the time. "My granddaughter is 18 years old and she has no sense of hometown. She is studying in Australia and only comes back during Spring Festival," said Ren Tingyu. With the development of Chinese economy, about 70 percent of the residents of Shishe village have bought houses in the county for their childrens' marriages. Many young descendants have moved to big cities. However, many old villagers still want to rebuild the old houses in the village. "If we do not rebuild the old house in the village, our home will soon be gone forever," said by Ren Tuanjie. The changes in Shishe village are a reflection of modern China. With the fastest development in the past three decades, a lot of villagers have moved into cities and their young generations are not familiar with their ancestral home. However, the old generations are deeply rooted in their hometown no matter how far away they happen to be. A family tree, a family photograph and even the old house in the hometown are the connection for those who have left their ancestral home. A supersize family photo of 500 members of the Ren family has brought together those scattered across the country after departing from their ancestral home.